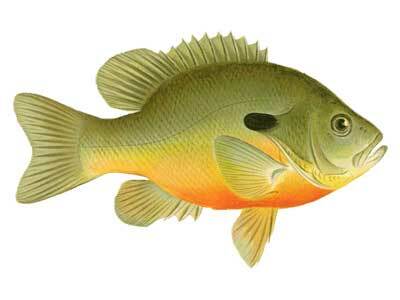 The longear sunfish was among the first North American fishes to be described in literature. In 1818, European naturalist Constantine Rafinesque encountered the species on the Ohio River while collecting new specimens of plants, fossils, and animals for science. The longear sunfish occurs principally in headwater streams and less often in bigger creeks and rivers. They prefer clear, shallow, warm areas bordered with aquatic vegetation. Longear sunfish feed on the surface more than other sunfishes, preying on mayfly, caddisfly, damselfly, moths, and other insects. Longear sunfish sometimes follow along behind northern hog suckers, devouring invertebrates or small fish that get stirred up. Their relatively large mouth allows them to consume small crayfish or baitfish. During the summer season, longear sunfish often orient to pools, moving seasonally to spawn or to evade temperature extremes. Their need to move freely throughout watersheds is often restricted by dams, culverts, or other blockages.